TRX-Star* T40 bits, breaker bar knuckles, drill bits, cutting blades and taps & dies. Repair kits will be sent out for most ratchet wrenches. Chrome Vanadium steel jaws, tubular steel handles and comfortable rubber grips. 10mm Capacity for soft metals. Drop-forged Chrome Vanadium steel with fully polished shafts and WallDrive® rings. Suitable for storing frequently used tools such as screwdrivers, hammers, pliers and spanners. Includes accessory tray, four hanging hooks and two clip on parts/stationery holders. Manufactured from high grade Chrome Vanadium steel. Metric hex keys 1.5-10mm with blackened finish for corrosion resistance. Includes T-handle which fixes securely onto each hex key to provide additional torque, comfort and support. Drop-forged and heat treated for added strength. 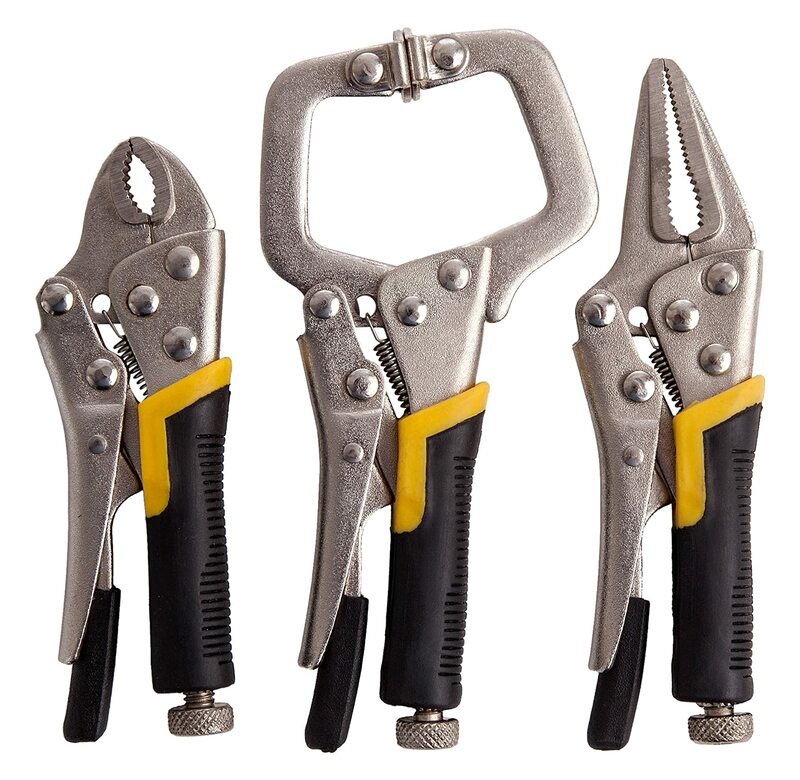 Features deeply serrated jaws on curved and long nose pliers and smooth flat self-adjusting pads on ‘C’ clamp pliers, all with spring loaded locking mechanism. Ideal when access is limited and for work on small applications. Supplied with soft grip handles for added comfort and control. Sealey drop-forged Chrome Vanadium steel spanners, fully polished with a mirror finish. Hardened and tempered for corrosion resistance. Comprises seventeen combination spanners with Wall Drive rings, ten stubby combination spanners with Wall Drive rings, eight deep offset spanners with bi-hex rings and four TRX-Star. Precision screwdrivers with spinners tops for fingertip control. Chrome Vanadium shafts with satin finish. Mini diagonal cutting pliers and mini long nose pliers with handle isulation. Tough polypropylene construction with protective safety cap. Ergonomic grip for comfort and control. Suitable for removing labels, decals and paint from glass or metal surfaces. Includes one standard razor blade. Box of 8pcs supplied in a counter top display. 2mm Ultra-stiff, hardened stainless steel scraper blades. Suitable for numerous workshop and bodyshop tasks including gasket scraping and windscreen preparation. Selection of popular-sized high grade steel sockets and Chrome Vanadium bits. 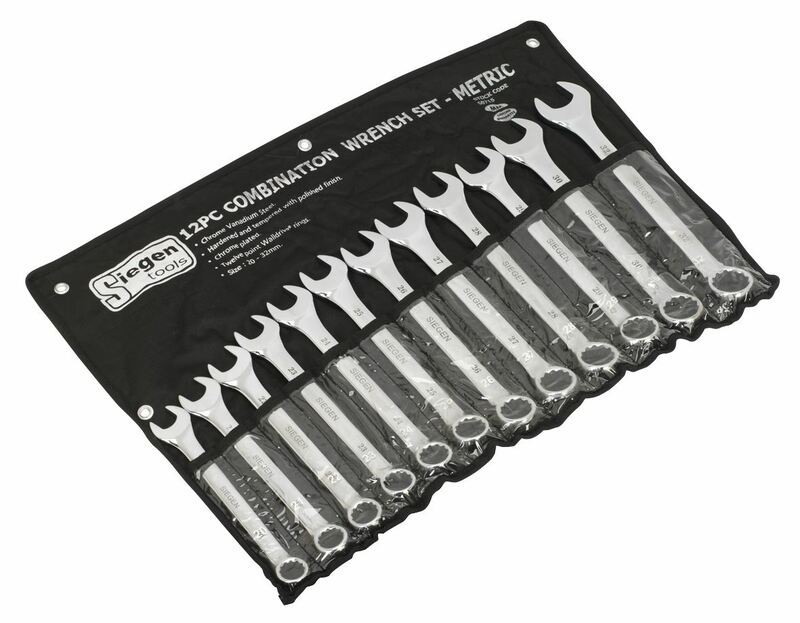 Adjustable wrench with Metric calibration and comfort grip, provides reliable drive. Ratchet wrench with flip reverse, quick release and comfort grip. Includes extension bar, comfort grip ratchet screwdriver, adaptor and bit adaptor. 1/4"Sq Drive Sockets; 4, 4.5, 5, 6, 7, 8, 9, 10, 11, 12mm, 5/32", 3/16", 7/32", 1/4", 9/32", 5/16", 11/32", 3/8", 7/16", 1/2"
3/8"Sq Drive Sockets; 13, 14, 15, 17mm, 9/16", 5/8", 3/4"
75mm Extension Bar, 1/4" x 3/8"
Stubby Ratchet Wrench, 1/4" x 3/8"
Dual action 72-tooth twist reverse ratchet wrench. Moving the handle backwards and forwards rotates the drive in one direction allowing use where space is at a premium. Can also be used as a regular ratchet or as a ratcheting speed brace. Fitted with a softgrip handle for comfort and control. List Price £ Dual action 72-tooth twist reverse ratchet wrench. Composite body with soft rubber grip for comfort and control. Two double-ended bits stored integrally, one at either end. Includes pocket clip. Supplied in display box of 30. Drop-forged Chrome Vanadium steel combination spanners. Hardened, tempered and nickel chrome plated with a fully polished mirror finish. Open end and twelve point WallDrive® ring combination. Comprehensive range of fully polished sockets and 1/4 hex bits. Comfort grip ratchet with quick release and flip reverse. Supplied in metal storage case with high density foam liner. Standard or T-bar driver with soft grip handle. Set includes sockets, bits, extension bar and drive adaptor. Chrome Vanadium steel sockets, spark plug sockets, extension bars, universal joint, sliding T-bar adaptor and pear-head flip reverse ratchet wrench, all with fully polished chrome finish. Supplied in carry-case. Contents: Sockets; 6, 7, 8, 9, 10, 11, 12, 13, 14, 15, 16, 17, 18, 19, 20, 21, 22, 24mm, Spark Plug Sockets; 16, 21mm, Extension Bars; 45, 75, 150mm, Universal Joint, Sliding T-Bar Adaptor; 3/8"(M) - 1/2"(F), Quick Release Reversible Ratchet Wrench. Soft grip handles for added comfort and control. Eight screwdrivers and ten precision screwdrivers to suit a wide range of applications. Supplied on a tough composite tool rack. Contents: Screwdrivers; Slotted - 6 x 38, 5 x 75, 6 x 100, 8 x 150mm, Phillips - #1 x 75, #2 x 38, #2 x 100, #3 x 150mm, Precision Screwdrivers x 50mm; Slotted - 2, 2.5, 3, Phillips - #00, #0, TRX-Star* - T5, T6, T7, T8, T9. Suitable for use where access is limited. Jaws incorporate long section for gripping flat material and curved section for pipes and tubes. Long nose locking pliers suitable for where access is limited. Jaws incorporate long section for griping flat material and curved section for pipes and tubes. Manufactured from top grade stainless steel. Comprises three pocket tools and torch. 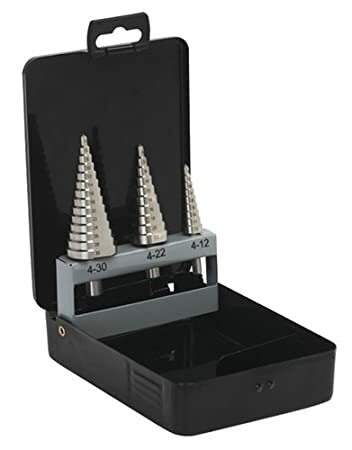 Three high-speed steel double flute step drills. Allows clog free, precision drilling of eighteen different size holes between 4-30 mm with just three bits. Sealey are one of the UK's leading suppliers of workshop tools and equipment, providing the distinctive products and service. Over 34 years experience in the industry, one of the choice of the professional. Made out of quality material. Synthetic bristles with square cut ends. Super strong magnetic tool holder with composite grip. Ideal for retaining and organising frequently used tools such as screwdrivers, sockets and spanners. Can be mounted onto any ferrous surface or carried to the job. Manufactured from Chrome Vanadium steel with a fully polished finish. Open end and twelve point WallDrive® ring combination. High torque three position reversible ratchet driver. Durable, impact resistant ratchet handle with integral bit storage. Includes six heat treated Chrome Vanadium steel double ended bits. Sealey heat treated drop-forged chrome vanadium steel Wall Drive socket with fully polished chrome finish for corrosion resistance. Six-point Wall Drive sockets for maximum torque transfer. Ratchets feature flip reverse and quick release mechanism. Supplied in robust carry-case. Sealey tools and equipment are primarily for use in an automotive atmosphere. Over 34 years experience in the industry Sealey is a ideal choice of the professional. Range is so vast that it covers a wide range of applications.